This page will take a little longer to load since it contains all of our on-line selections of baroque bead necklaces for all minerals. NOTE: If the images on this page do not load properly (or if they take too long to load! 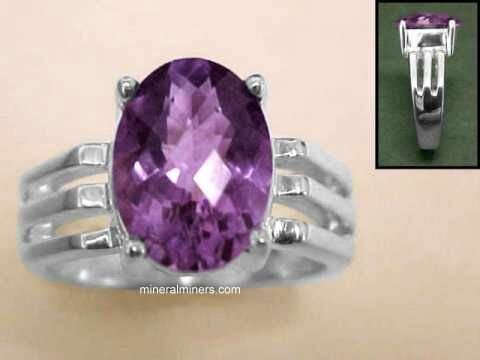 ), then you should visit our Alphabetical Jewelry Index where there are links to separate pages for each mineral variety, the images of our jewelry items on these specific mineral variety pages will load much faster. Click on any natural gemstone bead necklace image below to enlarge it. Natural color amethyst pieces were tumbled and polished in baroque shapes, and then drilled and strung in this 18 inch (45cm) amethyst necklace with a sterling silver clasp. 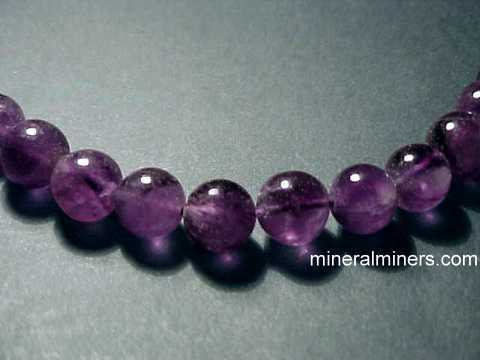 These amethyst beads are transparent, with beautiful violet-purple natural color. There are approximately 180 drilled baroque beads in each of these untreated amethyst necklaces. The photo at left shows a close-up view. See also a full view of this natural amethyst necklace. You can see our entire inventory of baroque Gemstone Bead Necklaces available in a wide variety of natural gem materials. Carnelian agate pieces from Brazil with superior color and transparency were tumbled and polished in baroque shapes, and then drilled and strung in a 34" (85cm) "endless" agate necklace. There are approximately 300 drilled baroque beads in each of these beautiful carnelian necklaces! The photo at left shows a close-up view. See a full view photo of this genuine carnelian agate necklace. We also have baroque bead necklaces in amethyst, apatite, green aventurine, citrine, garnet, labradorite, lapis lazuli, moonstone, peridot, rock crystal, rose quartz, smoky quartz, tanzanite, multi-color tourmaline and others. Carnelian pieces that were mined in Brazil were tumbled and polished in baroque shapes, and then drilled and strung in this 18" (45cm) long carnelian necklace with a sterling silver clasp. There are approximately 180 drilled baroque beads in each of these wonderful carnelian necklaces! See a full view photo of this genuine carnelian agate necklace. You can see our entire inventory of Baroque Bead Necklaces available in a wide variety of natural gem materials. 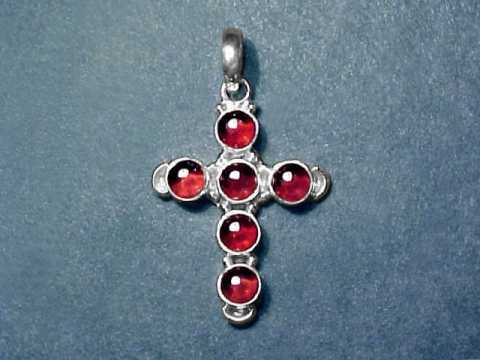 Superior quality natural garnet pieces with purplish-red natural color were mined in Africa and then tumbled and polished in baroque shapes. They were drilled and strung in this 18" (45cm) natural garnet necklace with a sterling silver clasp. There are approximately 180 drilled baroque beads with facet-grade transparency in each of these genuine red garnet necklaces! The photo at left shows a close-up view. These necklaces of baroque shaped almandine garnet beads make very nice gifts! You can see our entire inventory of tumble polished natural gemstone bead necklaces available in a wide variety of genuine gem materials. Natural color purplish-red garnet pieces from Africa were tumbled and polished in baroque shapes, and then drilled and strung in this 36 inch (90cm) "endless" natural red garnet necklace. There are approximately 350 drilled baroque beads in each of these beautiful garnet necklaces! The photo at left shows a close-up view. See also a full view of this natural color red garnet necklace. These necklaces of baroque shaped garnet beads make great gifts! We also have natural gemstone bead necklaces available in amethyst necklaces, apatite necklaces, aventurine necklaces, carnelian necklaces, citrine necklaces, labradorite necklaces, lapis lazuli necklaces, moonstone necklaces, peridot necklaces, rock crystal necklaces, rose quartz necklaces, smoky quartz necklaces, tanzanite necklaces, tourmaline necklaces and necklaces of several other natural gem materials! Gem grade pieces of natural color greenish-blue apatite mined in Madagascar were tumbled and polished in baroque shapes, and then drilled and strung in this 18" (45cm) long natural apatite necklace with a sterling silver clasp. These natural greenish-blue color apatite beads are lightly included to eye clean! There are approximately 200 drilled baroque beads in each of these beautiful apatite necklaces. The photo at left shows a close-up view, see also the full-view photo of this blue apatite necklace. You can see our entire inventory of Baroque Bead Necklaces, available in a wide variety of natural gem materials. Natural greenish-blue color apatite pieces from Madagascar with gem grade transparency were tumbled and polished in baroque shapes, and then drilled and strung in this 36 inch (90cm) "endless" apatite necklace. There are approximately 500 drilled lightly included to eye-clean beads in each of these natural apatite necklaces! At the left is a close-up view. See also a full view photo of this natural color blue apatite necklace. These natural color apatite bead necklaces make great gifts! Natural amethyst pieces from Africa with rich dark color and superior transparency were tumbled and polished in baroque shapes, and then drilled and strung in this 36" (90mm) "endless" amethyst necklace. There are approximately 300 drilled baroque beads in each of these untreated amethyst necklaces! The photo at left shows a close-up view. See also a full view of this natural amethyst necklace. These baroque bead amethyst necklaces make great gifts. We have two approximate diameter sizes available (see below): 5mm long, and also 7-8mm long. We also have necklaces with baroque beads available in apatite necklaces, aquamarine necklaces, green aventurine necklaces, carnelian necklaces, citrine necklaces, garnet necklaces, labradorite necklaces, lapis lazuli necklaces, moonstone necklaces, peridot necklaces, rock crystal necklaces, rose quartz necklaces, tanzanite necklaces, tourmaline necklaces and others! Temporarily out of stock, please come back later. Natural color aquamarine pieces from Brazil with pale blue-green color were tumbled and polished in baroque shapes, and then drilled and strung in this 36 inch (90cm) "endless" aquamarine necklace. There are approximately 350 semi-transparent aquamarine baroque beads per necklace. The photo at left shows a close-up view. See also a full view photo of this natural aquamarine necklace. These genuine aquamarine necklaces with baroque shaped beads make great gifts! You can see our entire inventory of tumble polished gemstone bead necklaces available in a wide variety of natural gem materials. Natural color aquamarine pieces that were mined in Brazil were tumbled and polished in baroque shapes, and then drilled and strung into this 18 inch (45cm) long aquamarine necklace with a sterling silver clasp. These aquamarine beads are semi-transparent to transparent, with beautiful green-blue color. There are approximately 180 drilled baroque beads in each of the natural aquamarine necklaces! The photo at left shows a close-up view. See also a full view photo of this natural aquamarine necklace. Superior quality citrine pieces with beautiful golden orange color that were mined in Brazil were tumbled and polished in baroque shapes, and then drilled and strung in this 18" (45cm) citrine necklace with a sterling silver clasp. The beads in this lovely citrine necklace have gem-grade transparency. There are approximately 190 drilled baroque beads in each of these beautiful citrine necklaces! 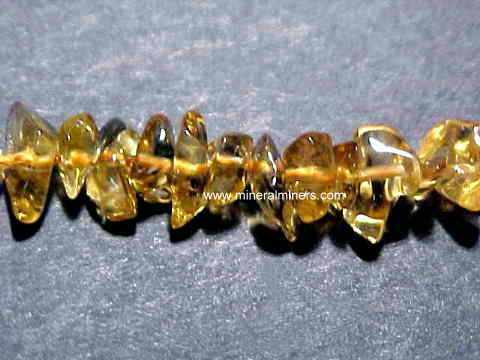 See also a full view of this 18 inch long citrine necklace. You can see our entire inventory of Baroque Shape Gemstone Bead Necklaces available in a wide variety of natural gem materials. Citrine pieces that were mined in Brazil with rich golden-orange color and gem-grade transparency were tumbled and polished in baroque shapes, and then drilled & strung in this 36" (90cm) "endless" citrine necklace. There are approximately 300 drilled baroque beads in each of these beautiful citrine necklaces! The photo at left shows a close-up view. See also a full view of this baroque bead citrine necklace. We also have baroque bead necklaces available in amethyst necklaces, apatite necklaces, green aventurine necklaces, carnelian necklaces, garnet necklaces, labradorite necklaces, lapis lazuli necklaces, moonstone necklaces, peridot necklaces, rock crystal necklaces, rose quartz necklaces, smoky quartz necklaces, tanzanite necklaces, multi-color tourmaline necklaces and others. Natural color iolite pieces from India with lovely blue-violet color were tumbled and polished in baroque shapes, and then drilled and strung in this 34 inch (88cm) "endless" iolite necklace. There are approximately 450 semi-transparent iolite baroque beads in each of these natural iolite necklaces. The photo at left shows a close-up view. See also a full view photo of this genuine iolite necklace. Natural lapis lazuli pieces with rich blue color were shaped into baroque beads and then drilled and strung in this 34" (87mm) "endless" lapis lazuli necklace. There are approximately 500 drilled baroque beads in each of these natural lapis lazuli necklaces! The photo at left shows a close-up view. See also a full view photo of this genuine lapis lazuli necklace. These beautiful lapis lazuli necklaces of baroque shaped beads make great gifts! We also have baroque bead necklaces in natural purple amethyst necklaces, natural blue apatite,natural green aventurine, natural carnelian, beautiful golden citrine, deep red-purple garnet, wonderful iridescent labradorite and moonstone, genuine peridot, colorless rock crystal, natural color rose quartz and smoky quartz, genuine tanzanite necklaces from Tanzania, Africa, multi-color tourmaline necklaces and others. Natural color lapis lazuli pieces that were mined in Afganistan were tumbled and polished in baroque shapes, and then drilled and strung in this beautiful 18" (45cm) lapis lazuli necklace with a sterling silver clasp. These lapis beads have very beautiful deep blue color. There are approximately 220 drilled baroque beads in each of these natural lapis lazuli necklaces. The photo at left shows a full view, see also a close-up view of this genuine lapis lazuli necklace. You can see our entire inventory of gemstone bead necklaces available in a wide variety of natural gem materials. This necklace of natural red spinel beads was hand-crafted from 100% natural color spinel that was mined near mahenge, Tanzania. 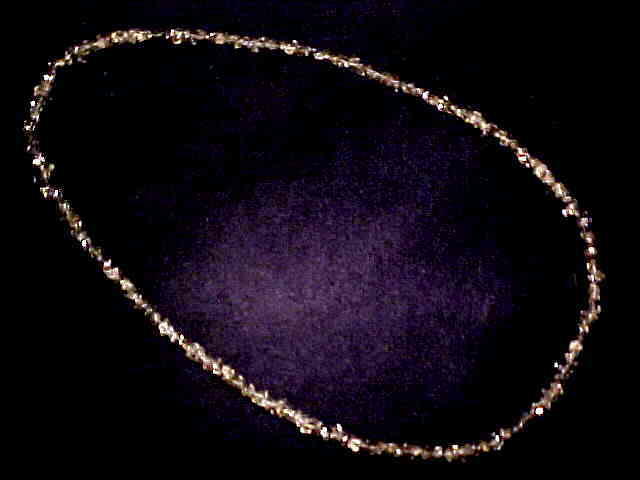 These tiny spinel pieces were polished, drilled and strung in an 18" length with a sterling silver clasp. These free-form shaped red spinel beads measure from 2mm to 4mm long, and they have light to dark red natural color. They are lightly included to eye-clean. The photo at left shows a close-up view, see also a full view photo of this natural red spinel necklace. Natural peridot pieces that were mined in Arizona were tumbled and polished in baroque shapes, and then drilled and strung in a 18" (45cm) peridot necklace with a sterling silver clasp. These peridot beads have facet grade transparency, with beautiful green natural color. The photo at left shows a close-up view. See also a full view of this natural peridot necklace. Natural peridot pieces with beautiful yellowish-green color and facet grade transparency were tumbled and polished in baroque shapes, and then drilled and strung in this 36" (90cm) "endless" peridot necklace. There are approximately 450 drilled baroque beads in each of these natural peridot necklaces! At the left is a close-up view. See also a full view of this natural peridot necklace. These baroque shaped peridot bead necklaces make great gifts! We also have baroque bead necklaces in natural amethyst necklaces, apatite necklaces, aquamarine necklaces, green aventurine necklaces, carnelian necklaces, citrine necklaces, garnet necklaces, labradorite necklaces, lapis lazuli necklaces, moonstone necklaces, rock crystal necklaces, rose quartz necklaces, tanzanite necklaces, tourmaline necklaces, and more! 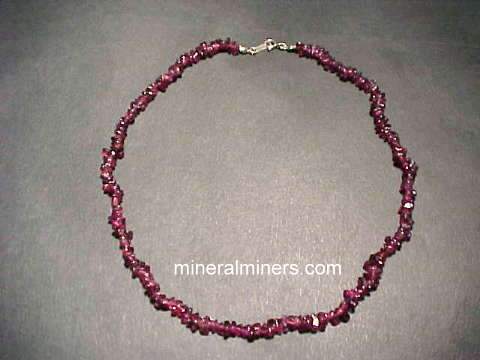 Natural color rhodolite garnet pieces mined in East Africa were tumbled and polished in baroque shapes, and then drilled and strung in this 18" (45cm) long rhodolite necklace with a sterling silver clasp. These rhodolite beads have facet-grade transparency, with beautiful brownish-reddish-pink color! There are approximately 200 drilled baroque beads per necklace. The photo at left shows a close-up view, see also the full-view photo. Naturally colorless rock crystal quartz pieces of superior quality were mined in Brazil and then tumbled & polished in baroque shapes. They were drilled and strung in this 18" (45cm) genuine quartz crystal necklace with a sterling silver clasp. These quartz crystal beads have beautiful gem-grade transparency. There are approximately 210 drilled baroque shape beads in each one of these natural quartz crystal necklaces. The photo at left shows a close-up view. See also a full view photo of this genuine quartz crystal necklace. You can see our Gemstone Bead Necklaces available in a wide variety of natural gem materials. Natural smoky quartz pieces from Brazil with superior grade transparency were tumbled and polished in baroque shapes, and then drilled and strung in this 34" (86cm) endless smoky quartz necklace. There are approximately 350 drilled baroque beads in each of these natural smoky quartz necklaces. The photo at left shows a close-up view. See also a full view of this smoky quartz bead necklace. These necklaces of baroque shaped smoky quartz beads make great gifts! Tanzanite pieces mined in Tanzania with beautiful lilac color were tumbled and polished in baroque shapes, and then drilled and strung in this 18" (45cm) long genuine tanzanite necklace with a sterling silver clasp. There are approximately 210 drilled baroque beads in each of these beautiful tanzanite necklaces! The photo at left shows a close-up view. See also a full view photo of this genuine tanzanite necklace. These necklaces of baroque shaped tanzanite beads make great gifts! We also have gemstone bead necklaces available in natural amethyst necklaces, apatite necklaces, green aventurine necklaces, carnelian jewelry, citrine necklaces, aquamarine necklaces, labradorite necklaces, lapis lazuli necklaces, moonstone necklaces, peridot necklaces, rock crystal jewelry, rose quartz necklaces, tourmaline jewelry and many others! This genuine tanzanite necklace is 36 inches long! Tanzanite pieces mined in Tanzania with beautiful lilac color under incandescent light as shown, were tumbled and polished in baroque shapes and then drilled and strung into this 18" (45cm) long genuine tanzanite necklace with a sterling silver clasp. There are approximately 400 drilled baroque beads in each of these beautiful tanzanite necklaces! The photo at left shows a close-up view. See also a full view photo of this genuine tanzanite necklace. We also have tumble polished gemstone bead necklaces available in many other natural gem materials. Natural tourmaline necklace with 190 carats of tourmaline beads! Natural color tourmaline pieces from Brazil in beautiful shades of green, blue-green and pink were tumbled and polished in baroque free-form shapes, and then drilled and strung in this 36" (90cm) "endless" tourmaline necklace. There are approximately 300 drilled semi-transparent beads in each of these natural tourmaline necklaces, with 190 carats total weight of 100% natural untreated tourmaline beads! The photo at left shows a close-up view. See a full-view image of this genuine tourmaline necklace. These tourmaline necklaces with baroque shaped beads make great gifts! Natural tourmaline necklace with 80 carats of tourmaline beads! Natural color tourmaline pieces that mined in Brazil with beautiful shades of green, blue-green and pink were tumbled and polished in baroque shapes, and then drilled and strung in this 18" (44cm) natural tourmaline necklace with a sterling silver clasp. There are over 230 drilled baroque beads in each of these tourmaline necklaces. Each necklace has 80 carats of natural tourmaline beads. These natural color tourmaline beads are semi-transparent to transparent. You can see our entire inventory of baroque Gemstone Bead Necklaces, available in a wide variety of natural gem materials. Small pieces of natural tsavorite green garnet with beautiful mint green natural color were drilled and strung in this 18" (45cm) genuine mint green garnet necklace with a sterling silver clasp. There are approximately 300 drilled baroque shape beads in each of these natural tsavorite garnet necklaces! The photo at left shows a close-up view. 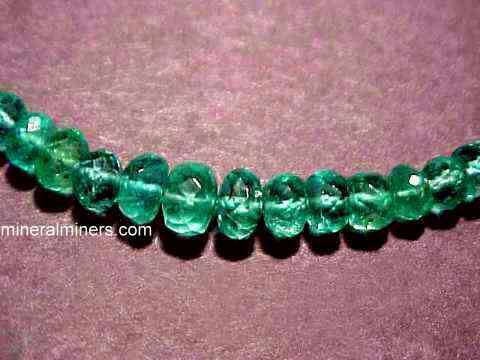 See also a full view photo of this natural tsavorite green garnet necklace. These natural mint green tsavorite garnet necklaces make great gifts! We have gemstone bead necklaces available in a wide variety of other gem materials. Be sure to see our entire selection of baroque shape gemstone bead necklaces. Transparent tourmaline pieces of superior quality in beautiful shades of Natural color pink were tumbled and polished in baroque shapes, and then drilled and strung in an 18 inch long untreated pink tourmaline necklace with a sterling silver clasp. There are approximately 300 drilled pink tourmaline beads per necklace! These natural color tourmaline beads are semi-transparent to transparent. The photo at left shows a close-up, see also a full-view photo of this natural pink tourmaline necklace. This is the end of our Natural Gemstone Baroque Bead Necklaces page. See also our Natural Gemstone Bead Bracelets. Would you like us to inform you when we add on this page more baroque shape natural gemstone bead necklaces? We do have a large inventory of natural gemstone bead necklaces in stock, so be sure to let us know if you have any special requests. Please contact our webmaster or our 'site' geologist with any questions or comments.